and GHANDOURA EL SAGHIRA. Close related to MASRI EL SALAAM. Her mother GHANDOURA EL SAGHIRA is a grandchild to GALAL. In her strain the origin Kuhaylan Rodania mare MALAKA. The crossing to ANSATA EL SALAAM - one more breeding-success. Multi-Champion-Mare PYRAMID SET EL NIL was also a Multichampion-Producer . the marvellous filly PYRAMID LANEYA born 23.Juni 2002. Look at her - isn´t she fantastic? 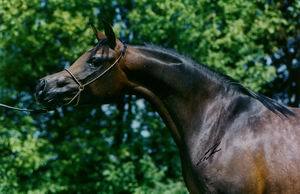 the wonderful young Stallion AL LAHAB. Click here to see PYRAMID LUTFIYAH .